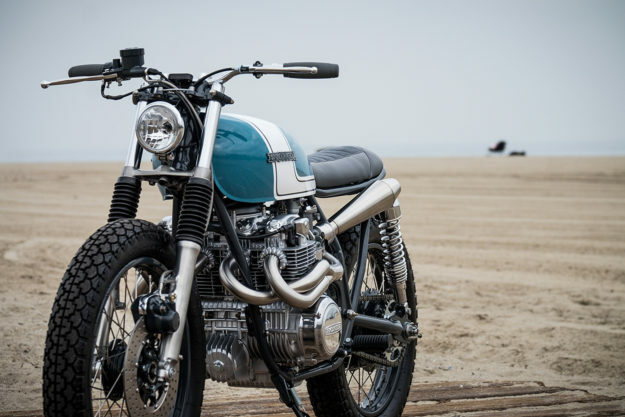 Two heavily modified CB550s in one week: are we seeing a renaissance of interest in Honda’s classic middleweight? 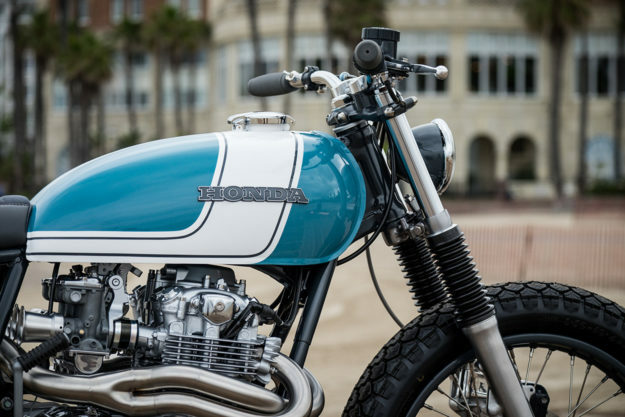 If the new builds coming through are as good as this street scrambler from Florida’s J. Webster Designs and the Hookie Co. cafe racer, we’re all for it. 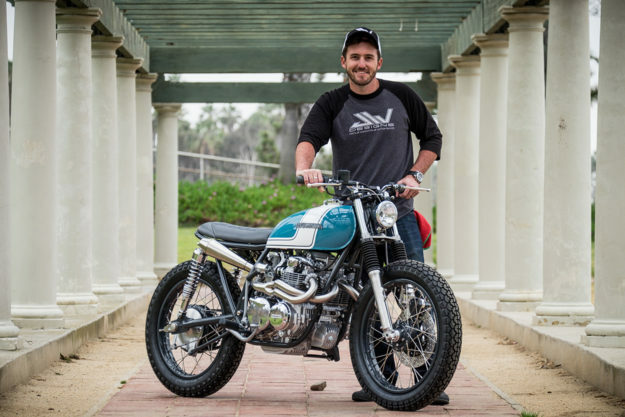 Justin wowed us five months ago with an amazing CB750 cafe racer, and he’s just proved he’s not a one-hit wonder. 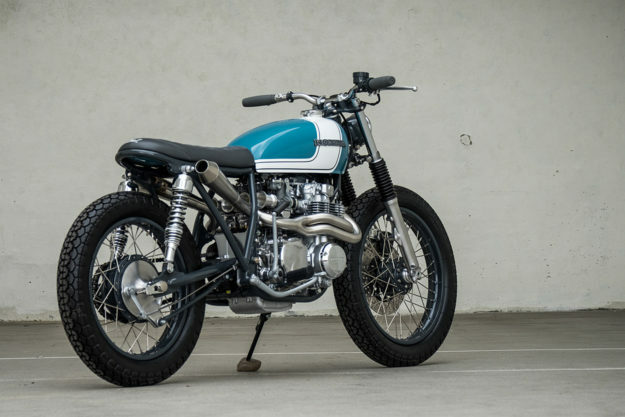 This latest creation is a 1974 Honda CB550 that he’s called the City Scrambler: “It’s a stripped-down, lightened, shaved and smoothed fun machine designed to tackle anything the city can throw your way,” he says. Justin takes an unusual approach when visualizing his builds. He likes to imagine what a contemporary prototype would have looked like, if displayed on a manufacturer booth back in the day. 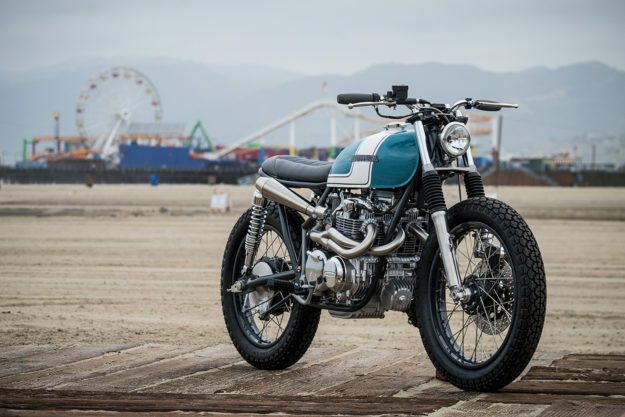 “If Honda’s design and engineering crew in the 70s had built a four-cylinder ‘scrambler’ prototype meant for the city, I believe it’d have looked something like this,” says Justin. 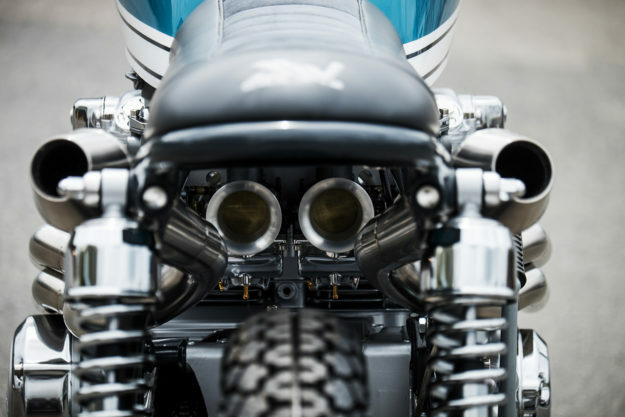 The detail in Justin’s work is certainly on a par with your typical factory job—and even better than some of the slightly wonky ‘concepts’ we’ve seen at moto shows. At the start of the build, Justin dismantled the CB550 down to the last nut and bolt, giving close attention given to every part. The frame was stripped and shaved of all non-essential weight and bracketry, and strengthened where needed. He’s made some subtle modifications—such as frenched-in LED rear brake/turn lights and a rear hoop—and added functional items too, like an integrated helmet holder. “It’ll make life more enjoyable when you stop at your favorite brew house for a pint,” he smiles. The front end is now as smooth as a gallon of buttermilk going through a hound dog. The triple trees have been shaved and smoothed, and restyled a little to enhance the aesthetics. The lower triple tree has a hand-brushed raw steel finish, and Justin’s made an adjustable pedestal mount for the Bates-style headlight—just to get rid of fork ears and de-clutter the brand new fork tubes. The upper triple has received similar attention, plus a custom ‘cable keeper’ that tidies the throttle and clutch cables, brake lines and electrical wiring. A Motogadget Motoscope Mini speedo now rests on a custom ‘floating’ mount secured to the comfortable superbike-style bars. The speedometer gear drive was tossed due to the upgraded digital instrumentation, and replaced with Justin’s own proprietary Speedometer Gear Drive Delete. His J. Webster Designs brand also supplies the clamps that lock the bars into position (and add a touch of extra style up top). 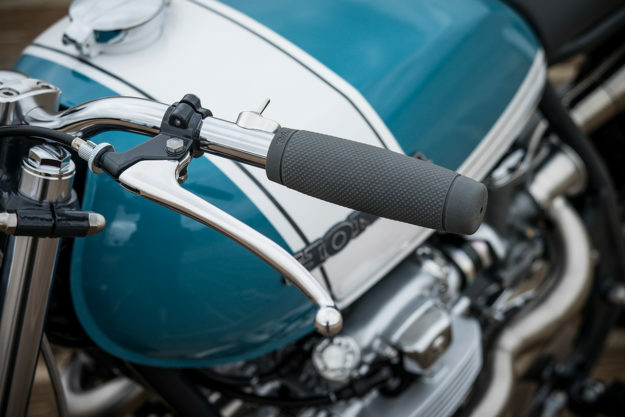 A single Posh Factory Mini switch commands the turn signals, and dark grey Biltwell Recoil grips echo the vintage color scheme. The forks have been rebuilt and reworked to provide better-than-factory ride quality, and the aluminum fork lowers have been treated to a hand-brushed aluminum finish. And to protect the chrome of the new legs, the gaiters are retained using a pair of J. Webster Designs Gaiter Collars. There’s lovely attention to powder coating, with the frame and wheels finished in a matching industrial anthracite grey color. The rims are laced up with stainless spokes from Buchanan’s, and shod with Dunlop K70 Gold Seal rubber—a modern reproduction of a vintage tread pattern. Justin’s stripped and rebuilt the motor, and worked the ports to make it a bit livelier. 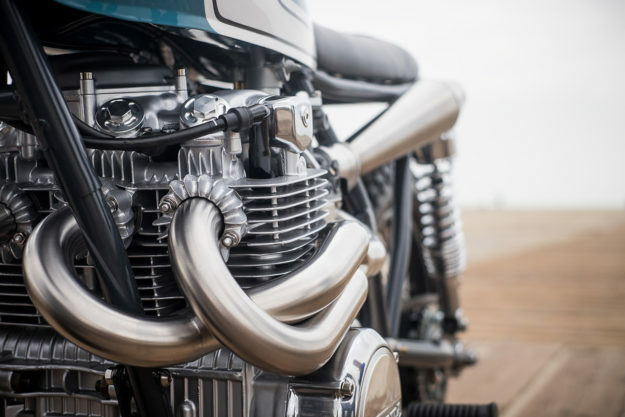 The carburetors were given a fresh new lease on life, a set of machined aluminum velocity stacks, and revised tuning to suit the handmade stainless steel exhaust. 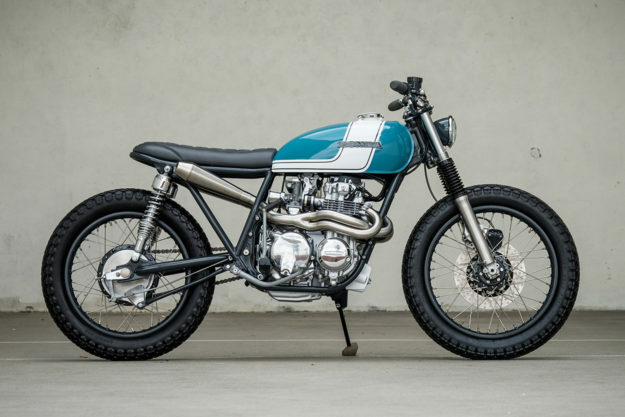 Which is nothing short of a work of art: a 4-into-2 high-mount system that snakes its way around the cylinders and through the frame, giving the CB550 the ground clearance of a true off-roader. The electronics are next-level too: the Honda has a phone-controlled brain, via a Bluetooth connection to Motogadget’s new m.unit Blue control box. The loom is more conventional, with low resistance, high strand wiring juiced up by a lithium Shorai battery. Charging duties are delegated to a regulator/rectifier combo unit from Rick’s Motorsport Electrics. As with all Justin’s builds, the paint is exceptionally lustrous: a retro-inspired deep sky blue and white scheme, with a subtle black pinstripe. 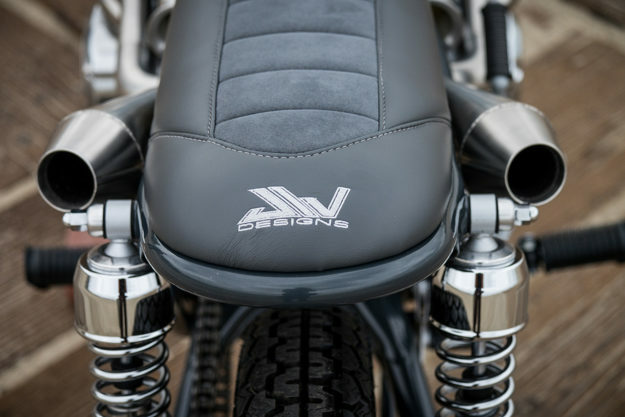 Right behind the tank is an ultra-plush suede and leather seat that follows the line of the subframe just perfectly. 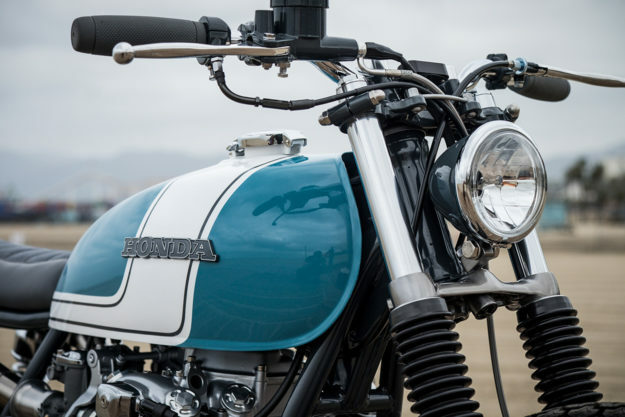 Scramblers are one of the defining trends in motorcycling at the moment, with excellent showroom offerings from Triumph, Yamaha and Ducati. But there’s no sign of Honda getting into the game. If you’re a fan of Big Red, there’s plenty of inspiration here. Sometimes the past is just as good as the present.